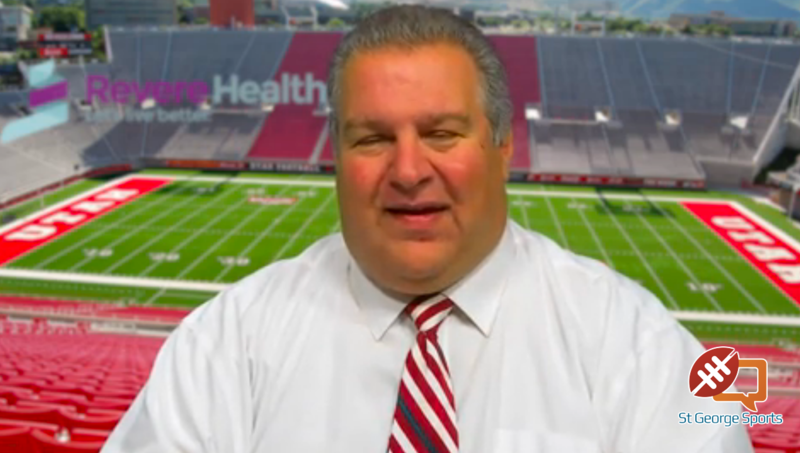 OGDEN – Overtime might have been easier. Get an easy two, tie the game and take your chances in the extra stanza. Yeah, that would have been the logical route. But Dixie coach Ken Robinson wanted nothing to do with overtime, so he drew up a play to win and his star player, Kelsey McCann, delivered Dixie its first ever girls basketball championship by hitting a 3-pointer with three seconds left as the Lady Flyers beat Desert Hills 33-32. Alyssa Tomlinson hit what would have been the game-winner for the Thunder after McCann’s trey, but her shot came an instant after the final buzzer and the fourth-seeded Flyers’ celebration ensued. 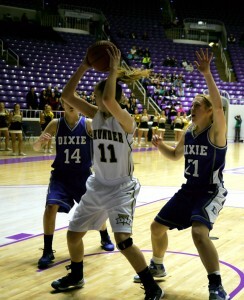 Dixie slowed the game down, limited its turnovers and played tough defense against the highly-favored Desert Hills squad. The strategy worked as Dixie led 20-14 at halftime and 26-23 after three quarters. Still, everyone in the building knew the top-ranked Thunder would make a run and they did. Tomlinson and Emily Seifert both scored to start the fourth quarter and give the Thunder a 27-26 lead. Liz Empey answered with a jumper to put Dixie ahead 28-27 with 3:42 to play in the game. 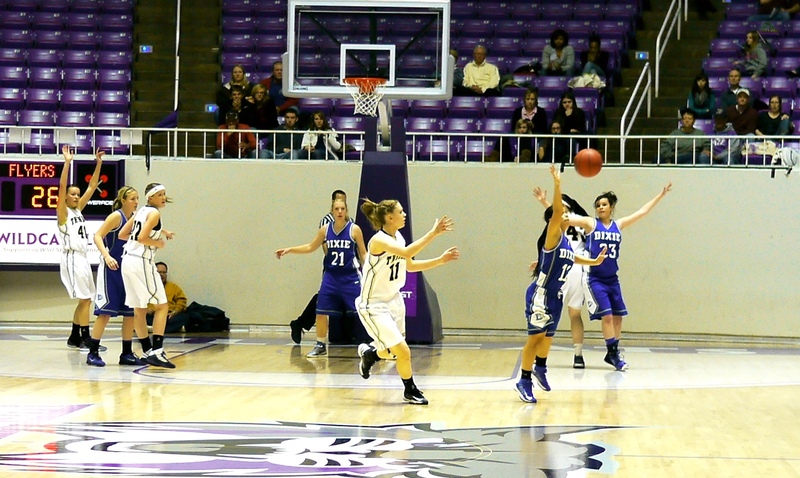 Again DH surged, this time getting back to back buckets by Blair Bliss. 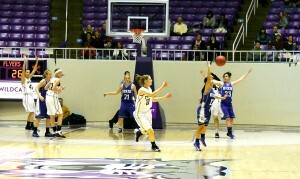 On the second one, she was fouled and her free throw made it 32-28 with 2:32 left in the game. The Flyers pulled to within 32-30 on a pair of free throws by Aubri Challis with 1:07 left. Bliss fouled out on the controversial play, leaving the Thunder to try and protect its lead without its star guard. Dixie put on its full-court press and forced a held ball: possession Dixie. The Flyers worked the clock down to 10 seconds, then Robinson drew up the play for the win. Dixie went into the game as heavy underdogs, having finished fourth in the region that Desert Hills won and having lost twice to the Thunder this season. But the Flyers were determined to prove something. “Not a lot of people believed in us, but we knew we could do it and we did it,” McCann said. Post player Caroline Lantor was tasked with the job of guarding Desert Hills star center Haley Bodnar. Though she had plenty of help, Lantor held her own. She was near tears after the emotional win. It is Dixie’s first state championship in school history in girls basketball. Robinson, who coached the Dixie boys for nearly two decades, did not win a title at Dixie, though he had one as head coach at Lehi. Robinson said he is retiring from coaching once again and this time he’s going out on top. McCann led Dixie with nine points and Thompson added seven. Bliss had 11 for Desert Hills, which has to settle for second place for the second straight year, although it is worth mentioning that the Lady Thunder have just two seniors on the team (Tomlinson and Whitni Atkin), so the 22-3 Thunder should be very good once again.